A community festival that features live music, family entertainment, carnival rides, a large arts and crafts fair, parade, fireworks and more! The Rivertown Days committee is working hard on a schedule of events for the 2019 event that will be posted in the spring. Please check back soon. Check out TONS of Rivertown Days photos HERE! Committee members were so impressed by the quality designs submitted for this year's Rivertown Days button contest, they chose a second design for the t-shirt! 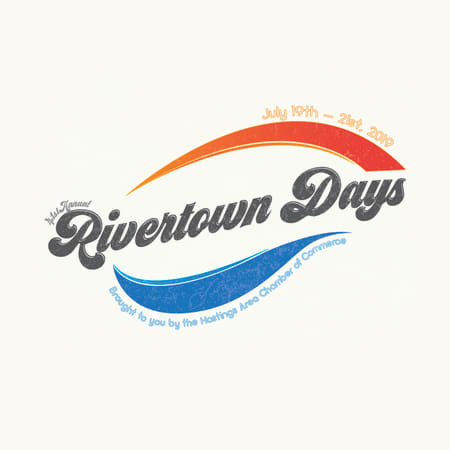 Congratulations and thank you to Benjamin Miller who created the 2019 Rivertown Days t-shirt logo. Showcase your logo to thousands of guests by choosing to be an event sponsor. Deadline for sponsorship form is March 22, 2019. Rivertown Days is a community wide celebration and a perfect opportunity to get exposure at your place of business! Deadline for applications is May 6, 2019. The Rivertown Days Arts & Crafts Fair is made up of approximately 100 vendors and is located in Jaycee Park. Shop for a variety of home made Arts and Crafts and Commercial merchandise. Please submit application, MN ST19 form, payment, photos, and a self addressed stamp envelope to Rivertown Days Arts & Crafts Fair, 314 Vermillion St., Ste 100, Hastings, MN 55033. Deadline for applicants is May 31, 2019 or until full. The 2019 Hastings Rivertown Days Parade is a 100 unit parade featuring many of the Hastings businesses, city officials, and community groups. Deadline for Parade Application is May 24, 2019.